I went through a stage of buying quite a few bundles of figures from the US so it would more than likely been from one of those. Its great to see another one of these, and its again a family III coo figure. Im leaning towards it being a stamp error more than anything else. @parra72 if you ever sell it please contact me, id love to see one in hand. Doing a quick google search brought me to this thread tonight and I also rediscovered I was already a registered user as well! We also turned up a Darth Vader with this exact COO anomaly earlier this year. While ours didn’t have a saber, it has the provenance as I purchased it directly from the family member of a Kenner employee who would bring samples back from the Orient. Ours has a very thin, hand-cut cape and numbers under the feet which are visible with a black light. I also know of another example that recently turned up, also with provenance of a Kenner employee source, but also including a complete DT saber. I believe this is a prototype piece. Funny you should post here (if your the same lemcool from RS) as I just sent you a message on RS about a you tube video that came up in my list of videos to watch. 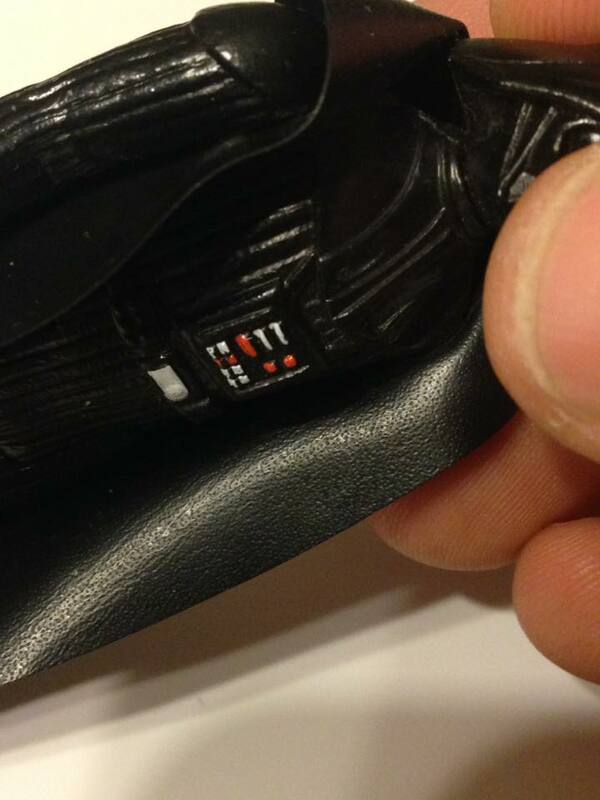 As far as this Vader goes, I believe that they are preproduction too; however as I said earlier provenance is key. Some of these seem to have filtered out to random people coming from unknown sources. Since there is nothing to indicate on those figures (no numbers on feet, proto accessories, etc.) it is impossible for a grading company or individual to say they are anything other than a rare variant coo. At least in my opinion. In other words from what I have read and through various people I have spoken to, without a kenner source there is no way to say with 100% accuracy that this mold did not get used for production even if for a very short time period. Claiming that a coo is prototype is a bit risky IMO. While 2 have turned up from sources with provenance, there are at least another 3 or 4 out there. and in the UK also. If we are claiming this coo to be a prototype coo, then can i call my 2 with no markings at all first shots ?? Yeah, I'm the same Lemcool on both pages. I saw your message- that was my brother. We will have a ton of stuff at Celebration next year for room sales. Ours has a prototype cape, very thing and hand cut. The other example that turned up in the past couple of months has a similar cape and a DT proto saber, so prototype accessories have been found with his COO. Also, the head has all sorts of anomalies which doesn't look production quality IMO. Several ROTJ figures are first shots if they have a COO that wasn't produced. Even the 12" C-3PO is authenticated as a first shot if it has three lines, so specific COO's are recognized as prototypes. You have two Darth Vaders with no markings at all? I began this thread with my Hon Kong Vader. I wanted to add that when Tom Derby checked out the photos of this figure he thought the cape may be a prototype. I disagree, alot has been said over the years, but in fact when a coo is added it is past the prototype stage. Its ready for production. If a coo is unproduced then it is exactlly that an unproduced coo, different to prototype. 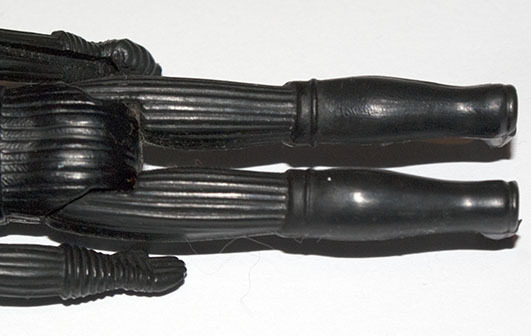 Yes i have 2 vaders with no markings and more are out there, most originate from UK, they are not prototypes. 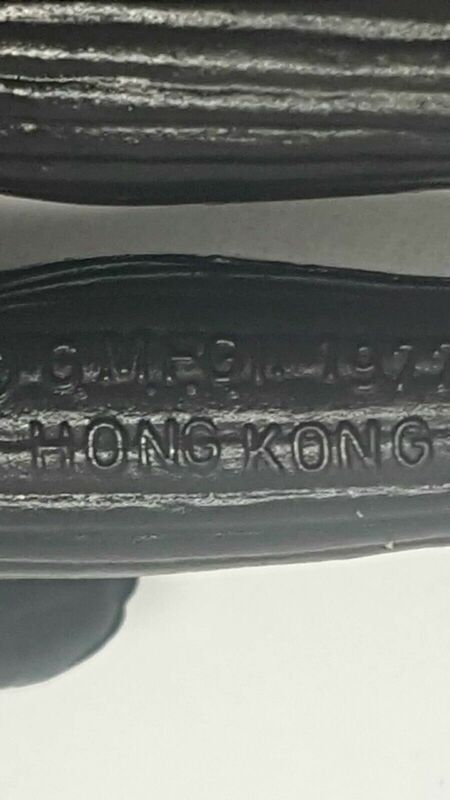 The molding imperfections you refer to on the head are a slight short shot. Plastic not hot enough or pressure from the machine not up to required standards will leave swirls in the plastic, most common on the head. I can show you numerous examples of this. Im not picking an argument with anyone, but i dont agree these HON examples are anything prototype. More than lilelly they picked up on the mistake and changed it very quicklly. 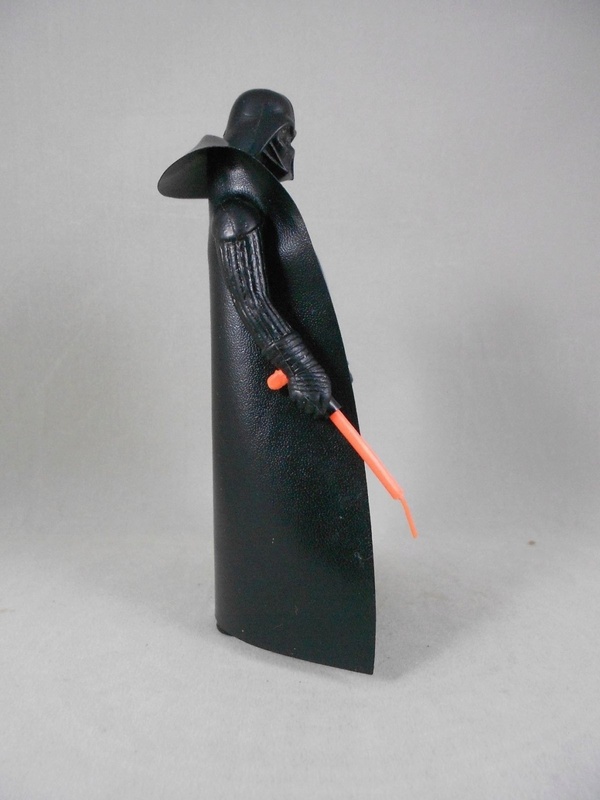 By the way the familly 3 coo Vader is one of the figures you get with 12 backs, which is why most or all the ones come to light have the flat tip, or lettered sabers. The 2 or 3 with kenner ex employees links are just that, figures come from an ex employee, having a circles DT saber doesnt make a prototype in my eyes. Circle variants where far and in between but quite a few have surfaced. And not on prototype figures. The Dewey Shumate example was listed as an EP, again different from prototypes. EP's are production sample figures taken from production runs and used for a variaty of product testing and quality control. These are way past the prototype stage. Below is a photo of the figure with no markings. Just for fun. Again incorrect, its pitted cape which 99.9% of the time when found is on coo family III which is the same coo as the HON figure. Oscar mentioned the pitted cape a year ago, above are two more examples of that cape also on mould family III figures. For anyone interested, there is a familyIII figure with this pitted cape on ebay at the moment. This coo stamp is a dominant coo with lettered sabers. And usually with shorter thinner, square corner capes. My take on this HON coo, small run was made and sent back for aproval, the mistake was picked up and changes were made. I ended up selling mine. Very happy with the result.